Focaccia is a flat oven-baked Italian bread product that is similar in style and texture to pizza dough. 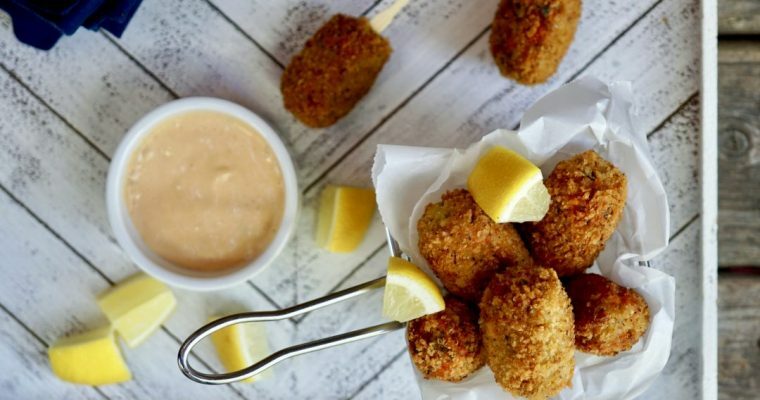 Crispy on the bottom, thanks to the generous amount of olive oil it is baked in, and soft, almost pillowy on top. This tasty savory bread is fantastic served by itself, but is versatile both in toppings and uses, from sandwiches to appetizers. 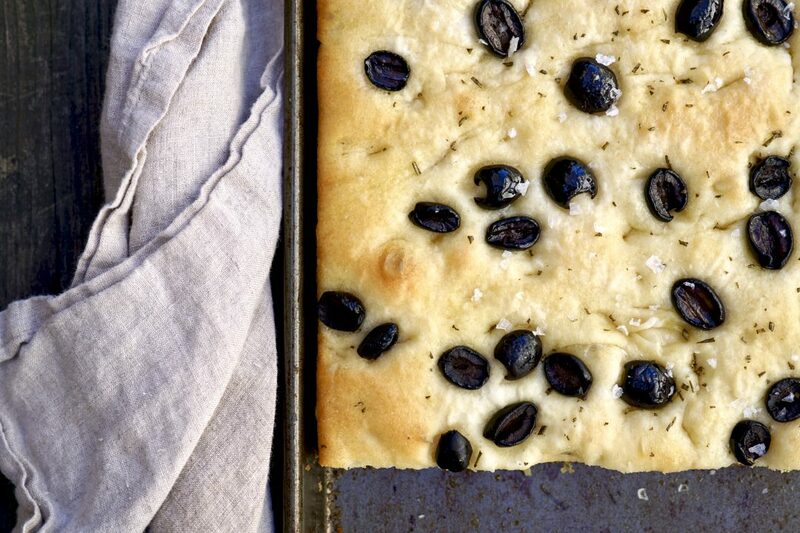 This is my easy rosemary Focaccia with the addition of black olives and flaky sea salt, a combination I love. To clarify, I am a chef, but not a bread baker, there’s a big difference between the two. Bread, is its own thing completely. I like to dabble in breads with simple recipes such as challahs or yeasted-based cinnamon rolls, but for now, that’s it. To me, focaccia falls in the “easy bread category“. This yeast-based flat bread should not intimidate you, its honestly not all that complicated. As with all yeast-based breads there is a rise time, but, unlike most other bread recipes out there, the baking method and shape of Focaccia is extremely forgiving. All you need to make it is a sheet pan and your hands. 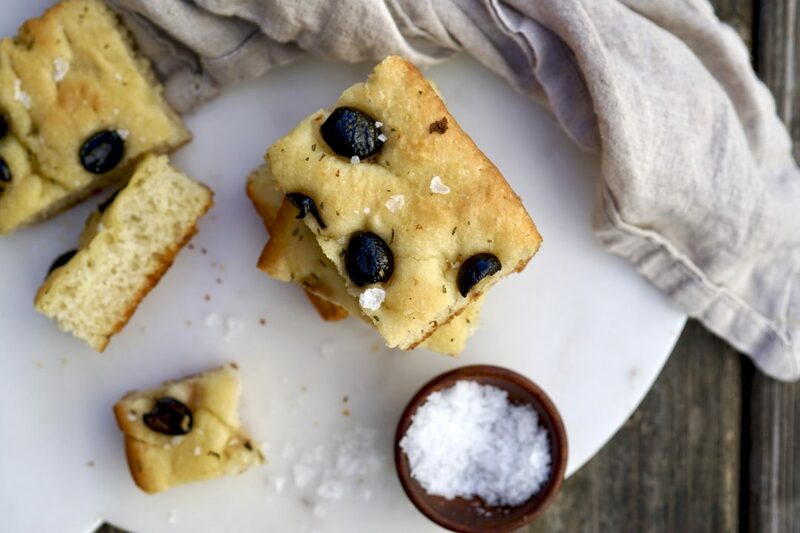 The basic recipe for Focaccia bread is believed to have originated with the Etruscans or Ancient Greeks. Most known and loved in Italy, this bread is predominant along the northern shores of the Mediterranean. Early versions of this style of bread were once cooked on the hearth of a hot fire, on a heated tile and on earthenware disks. Focaccia is punctured on top to relieve bubbling on the surface of the bread. Commonly, this practice of “dotting the bread” is done with your fingers to achieve the groove-like appearance that makes this bread so distinct. 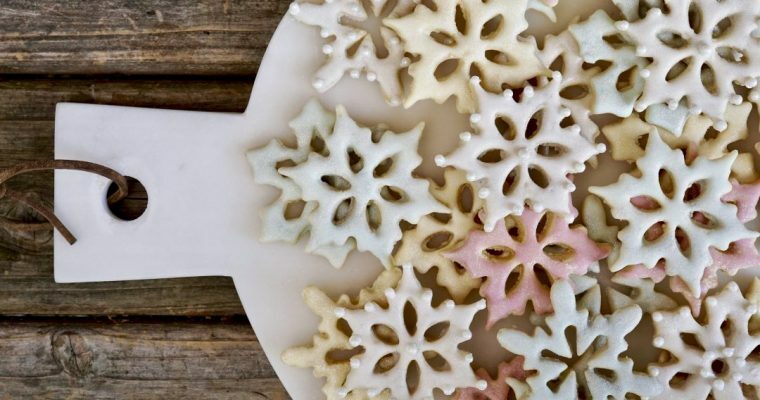 Dotting the uncooked dough creates small wells that remain intact during the baking process. But what’s the real purpose of these characteristic holes? The answer is, the holes help preserve moisture in the bread when baking. 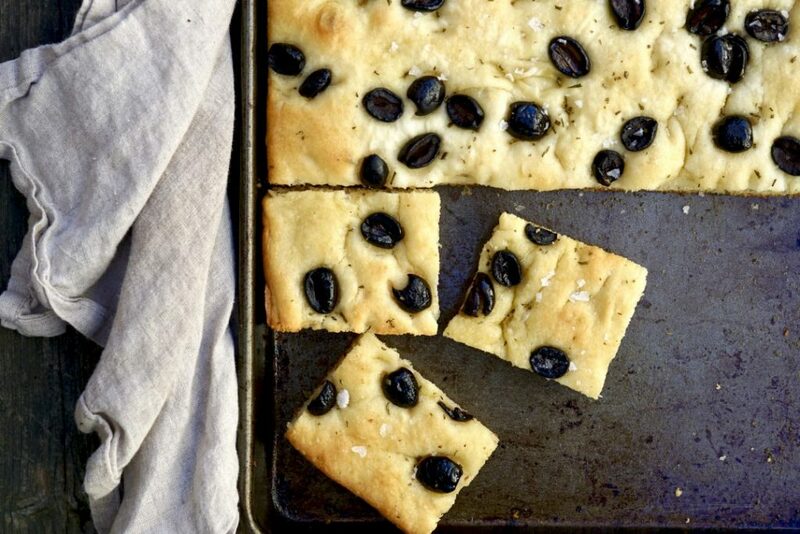 This, combined with rich olive oil drizzled over the dough prior to rising and baking, helps ensure focaccia’s irresistible soft fluffy center. Step 1 In a small bowl, add the warm water, yeast and sugar, stir to dissolve and let sit about 10 minutes, until the mixture is foamy. Step 2 In the bowl of a kitchen mixer, such as a KitchenAid, fitted with a dough hook, add the flour and 1 tablespoon of kosher salt. Mix on low until combined. Step 3 Add the yeast-water mixture and 1/2 cup of olive oil, mix on low until the dough comes together. Turn the speed up to medium knead for about 5 minutes, until the dough looks begins to look smooth and soft. Step 4 Transfer the dough to a clean, lightly floured work surface. Using your hands, gently knead the dough briefly until the dough comes together into a smooth ball. Step 5 Wipe out the mixer bowl and coat the inside of the bowl with about teaspoon of olive oil. Return the dough to the bowl, turning it twice so that both the top and bottom of dough are lightly coated in oil. Cover the bowl with plastic wrap and place in a warm, place until the dough has doubled in size, about 1 1/2-2 hours. Step 6 Coat a baking sheet with 1/4 cup of olive oil (this is critical to making the focaccia crispy). Place the dough on the prepared baking sheet and begin pressing it out with your hands to fit the size of the pan. Flip the dough over a few times to coat both sides with olive oil. Do your best to stretch the dough to fit the entire pan. Once the dough is stretched, use your fingers to make impressions 3/4’s of the way through the dough. Cover the pan with plastic wrap and place in the warm and allow the dough to puff up and rise again, about 1 hour. Step 7 Preheat the oven to 425 degrees F. Set the oven rack to the middle position. Step 8 When the dough has risen, sprinkle the top of the focaccia with 3/4 teaspoon flaky sea salt and chopped rosemary. 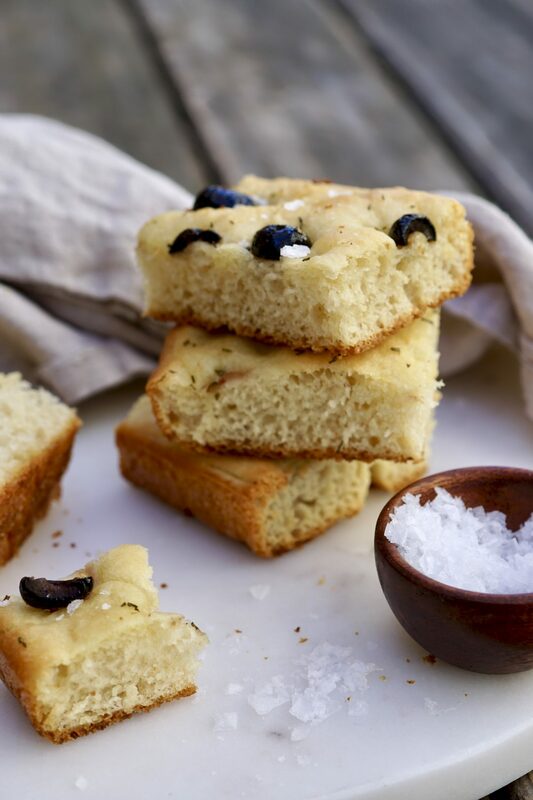 Scatter the olives all over and then lightly drizzle an additional 1-2 teaspoons olive oil on top of the focaccia. Bake, rotating the pan once, until golden brown, about 20 minutes. Step 9 Remove the focaccia from the oven and let it cool in the pan for about 15 minutes before slicing. Drizzle with additional olive oil if desired.